This past Saturday was the final 'install' day at my mom's home office (like that I used terminology from Million Dollar Decorators?) and I am so happy that it is finally finished. I started this project about a month ago and because of my schedule, I haven't been able to work on it until this past weekend. But I can happily say that it is done and looks even better than I had expected. Plus, I'm pretty sure my mom loves it just as much as I do. For this re-decorating project, we kept a lot of the existing pieces (desk, filing cabinet, bookcase) since they were still in good condition. Plus, we didn't want to have to spend unnecessarily. And to keep costs even lower, I did a few refinishing jobs as well as create a french board. Check out the process below and let me know how I did! Somehow there were two desks (yes, two!) in this room. I don't know how my mom worked in here but that was the first item of business when we started this re-do. 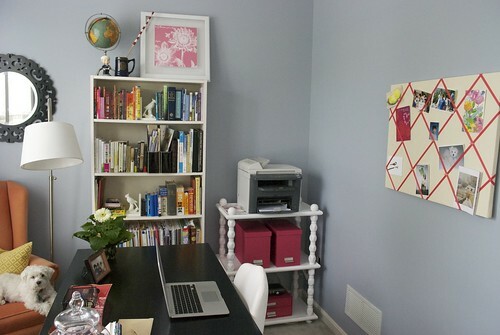 Get rid of the clunky, metal desk! 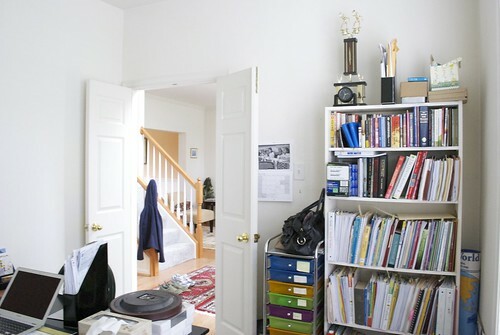 Just looking at that bookcase freaks me out - it's so messy! 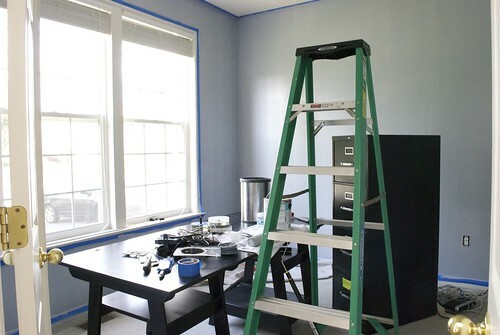 I was originally going to choose a bolder color, but during the brainstorming process, my mom tells me that they're planning on selling the house soon so that I should choose a more neutral color. After testing 3 different colors, I chose Slipstream by Martha Stewart. 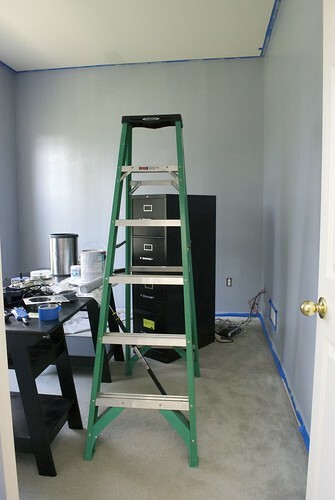 Thanks to my brothers, Tim & Mike, we were able to get this room painted in no time. The white printer table was a $12 find at Goodwill. All I had to do to make it presentable was to give it a few coats of primer and then paint it in a white high gloss paint. I chose Martha Stewart's Pure White in high gloss. It took several coats but the table looks nothing like what I paid $12 for. 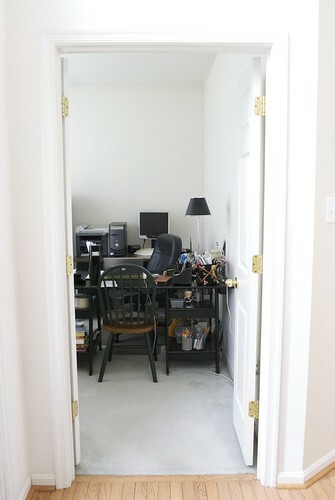 There will be a separate post for the printer table and chair so stay tuned! Because it went so well with the wall color and provided a little reading nook, the orange wing chair from the family room just had to be moved to the office. 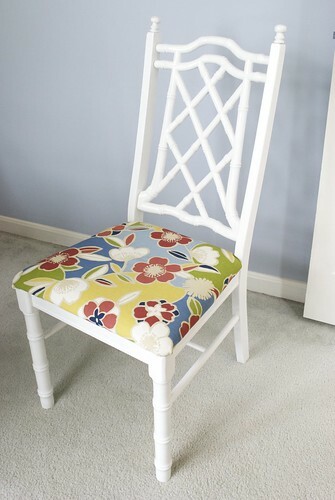 This was a $7 chair from Goodwill and all it needed was a fresh coat of paint and new fabric for the seat. I decided that this would replace the green Windsor chair since we still needed an extra chair for the student(s) that my mom tutors. I created a french board to go behind the desk chair since we needed something on that big wall. Wall art would've been fine, but this way my mom can put family photos up or cards she gets. Did you know that Blake Lively had to test out 14 different shades of brown for her hair in the Green Lantern? That's what I'm reading about right here. Black mirror, HomeGoods; Globe, HomeGoods; Retro White Swivel Chair, Craigslist; Pink Storage Boxes, The Container Store; Silver Floor Lamp, Target; Yellow Magazine Basket, Joann Fabrics; Chinoiserie White Upholstered Chair, Goodwill; White Printer Table, Goodwill. 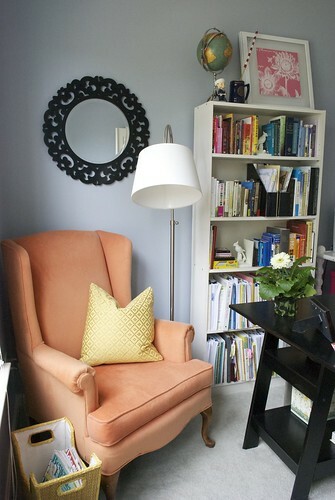 White tall bookshelf, Black Desk, Vertical Black File Cabinet, Orange Wing Chair, and Yellow Throw pillow. You did a wonderful job! I am sure your Mother is so thankful. I love the reading nook! Awesome! Looks great! 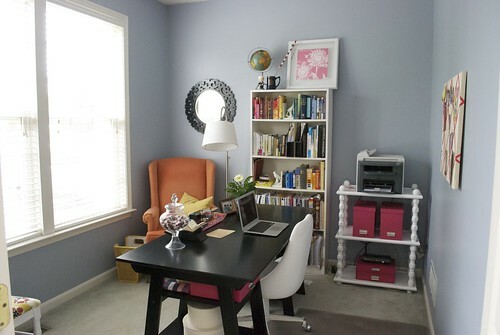 I also have a similar blue shade at my home office and a french board, but I want to make a HUGE one. Any suggestions? Love your blog, Christina! @Kathysue - Thank you!! 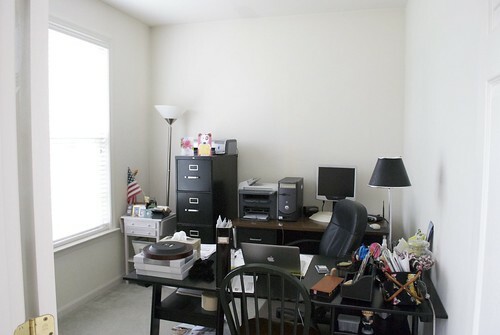 It was a really great room to redo, and the fact that my mom loves the room makes me SO happy. @Sylvia - Thanks girl!! Depending on how large you want your french board to be, I'd say get 2 large foam boards and lay them so that they create one giant one. Then wrap it with batting and fabric and staple it all on the back. That would be (in my mind) the best way to create a really big french board. 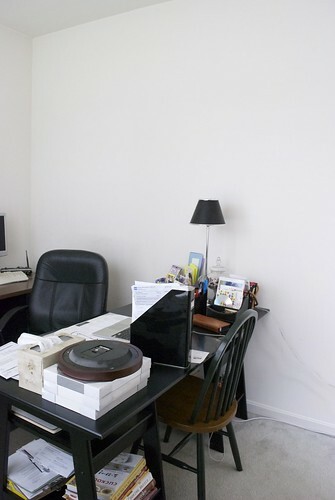 Or if you can find a cork board/stretched canvas to the desired size, you could use those too. Beautiful! 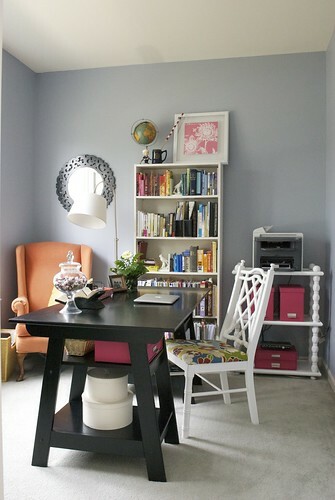 I love the contrast between the gray/blue walls and the orange chair, and the white printer table and bamboo(?) 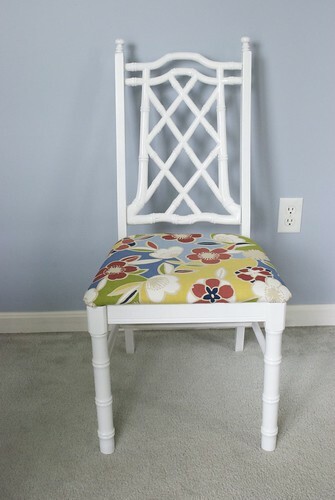 chair are amazing! We can't wait to see you guys this weekend! @Mary Ellen - Thank you!! Yea, that orange chair was a great fit in the room. Although, now my dad is sad since he really liked it in the family room. I can't wait to see you too! And I can't wait to see your place! We've got lots to catch up on! What a great transformation! 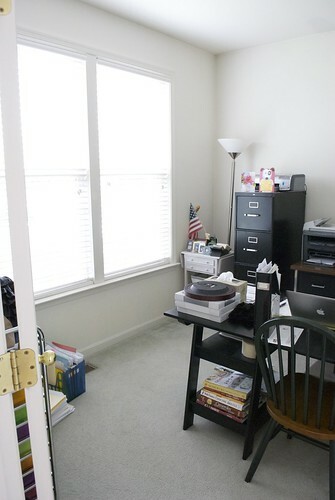 More and more mothers need this in their lives as more and more begin to work from home. 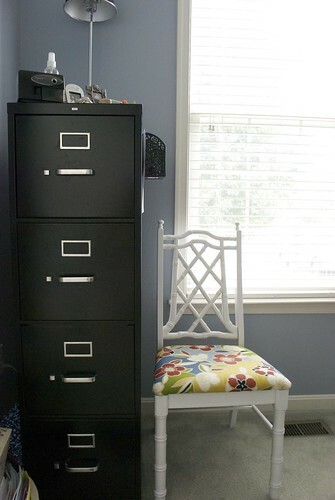 There's some really cool other things on CoffeyBuzz that could help with the organization of a busy home office. Check it out! Love this makeover! Can I pay you to do our house? I love how it turns out! Thank you for sharing!